Claude Monet was born on 14 November 1840 on the fifth floor of 45 rue Laffitte, in the 9th arrondissement of Paris.He was the second son of Claude Adolphe Monet and Louise Justine Aubrée Monet, both of them second-generation Parisians. On 20 May 1841, he was baptized in the local parish church, Notre-Dame-de-Lorette, as Oscar-Claude, but his parents called him simply Oscar. (He signed his juvenilia "O. Monet".) Despite being baptized Catholic, Monet later became an atheist. In 1845, his family moved to Le Havre in Normandy. His father wanted him to go into the family grocery business, but Monet wanted to become an artist. His mother was a singer. On 1 April 1851, Monet entered Le Havre secondary school of the arts. Locals knew him well for his charcoal caricatures, which he would sell for ten to twenty francs. Monet also undertook his first drawing lessons from Jacques-François Ochard, a former student of Jacques-Louis David. On the beaches of Normandy around 1856 he met fellow artist Eugène Boudin, who became his mentor and taught him to use oil paints. Boudin taught Monet "en plein air" (outdoor) techniques for painting.Both received the influence of Johan Barthold Jongkind. On 28 January 1857, his mother died. At the age of sixteen, he left school and went to live with his widowed, childless aunt, Marie-Jeanne Lecadre. When Monet traveled to Paris to visit the Louvre, he witnessed painters copying from the old masters. Having brought his paints and other tools with him, he would instead go and sit by a window and paint what he saw.Monet was in Paris for several years and met other young painters, including Édouard Manet and others who would become friends and fellow Impressionists. In June 1861, Monet joined the First Regiment of African Light Cavalry in Algeria for a seven-year commitment, but, two years later, after he had contracted typhoid fever, his aunt intervened to get him out of the army if he agreed to complete an art course at an art school. It is possible that the Dutch painter Johan Barthold Jongkind, whom Monet knew, may have prompted his aunt on this matter. Disillusioned with the traditional art taught at art schools, in 1862 Monet became a student of Charles Gleyre in Paris, where he met Pierre-Auguste Renoir, Frédéric Bazille and Alfred Sisley. Together they shared new approaches to art, painting the effects of light en plein air with broken color and rapid brushstrokes, in what later came to be known as Impressionism. In January 1865 Monet was working on a version of Le déjeuner sur l'herbe, aiming to present it for hanging at the Salon, which had rejected Manet's Le déjeuner sur l'herbe two years earlier.Monet's painting was very large and could not be completed in time. (It was later cut up, with parts now in different galleries.) Monet submitted instead a painting of Camille or The Woman in the Green Dress (La femme à la robe verte), one of many works using his future wife, Camille Doncieux, as his model. Both this painting and a small landscape were hung.The following year Monet used Camille for his model in Women in the Garden, and On the Bank of the Seine, Bennecourt in 1868. 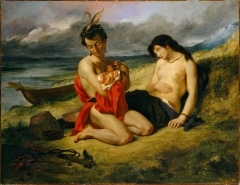 Camille became pregnant and gave birth to their first child, Jean, in 1867. Monet and Camille married on 28 June 1870, just before the outbreak of the Franco-Prussian War, and, after their excursion to London and Zaandam, they moved to Argenteuil, in December 1871. During this time Monet painted various works of modern life. He and Camille lived in poverty for most of this period. Following the successful exhibition of some maritime paintings, and the winning of a silver medal at Le Havre, Monet's paintings were seized by creditors, from whom they were bought back by a shipping merchant, Gaudibert, who was also a patron of Boudin. After the outbreak of the Franco-Prussian War (19 July 1870), Monet and his family took refuge in England in September 1870, where he studied the works of John Constable and art Mallord William Turner, both of whose landscapes would serve to inspire Monet's innovations in the study of color. In the spring of 1871, Monet's works were refused authorisation for inclusion in the Royal Academy exhibition. In May 1871, he left London to live in Zaandam, in the Netherlands,where he made twenty-five paintings (and the police suspected him of revolutionary activities). He also paid a first visit to nearby Amsterdam. In October or November 1871, he returned to France. From December 1871 to 1878 he lived at Argenteuil, a village on the right bank of the Seine river near Paris, and a popular Sunday-outing destination for Parisians, where he painted some of his best-known works. In 1873, Monet purchased a small boat equipped to be used as a floating studio. From the boat studio Monet painted landscapes and also portraits of Édouard Manet and his wife; Manet in turn depicted Monet painting aboard the boat, accompanied by Camille, in 1874. In 1874, he briefly returned to Holland. The first Impressionist exhibition was held in 1874 at 35 boulevard des Capucines, Paris, from 15 April to 15 May. The primary purpose of the participants was not so much to promote a new style, but to free themselves from the constraints of the Salon de Paris. The exhibition, open to anyone prepared to pay 60 francs, gave artists the opportunity to show their work without the interference of a jury. Renoir chaired the hanging committee and did most of the work himself, as others members failed to present themselves. 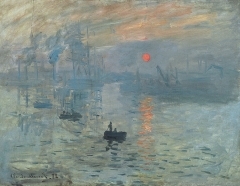 In addition to Impression: Sunrise (pictured above) Monet presented four oil paintings and seven pastels. Among the paintings he displayed was The Luncheon (1868), which features Camille Doncieux and Jean Monet, and which had been rejected by the Paris Salon of 1870.Also in this exhibition was a painting titled Boulevard des Capucines, a painting of the boulevard done from the photographer Nadar's apartment at no. 35. Monet painted the subject twice, and it is uncertain which of the two pictures, that now in the Pushkin Museum in Moscow, or that in the Nelson-Atkins Museum of Art in Kansas City, was the painting that appeared in the groundbreaking 1874 exhibition, though more recently the Moscow picture has been favoured.Altogether, 165 works were exhibited in the exhibition, including 4 oils, 2 pastels and 3 watercolors by Morisot; 6 oils and 1 pastel by Renoir; 10 works by Degas; 5 by Pissarro; 3 by Cézanne; and 3 by Guillaumin. 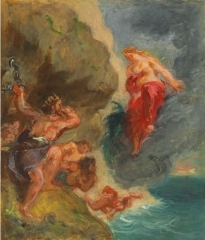 Several works were on loan, including Cézanne's Modern Olympia, Morisot's Hide and Seek (owned by Manet) and 2 landscapes by Sisley that had been purchased by Durand-Ruel. The total attendance is estimated at 3500, and some works did sell, though some exhibitors had placed their prices too high. Pissarro was asking 1000 francs for The Orchard and Monet the same for Impression: Sunrise, neither of which sold. 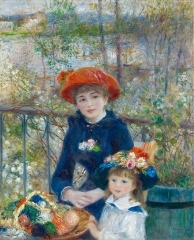 Renoir failed to obtain the 500 francs he was asking for La Loge, but later sold it for 450 francs to Père Martin, dealer and supporter of the group. In 1876, Camille Monet became ill with tuberculosis. Their second son, Michel, was born on 17 March 1878. This second child weakened her already fading health. In the summer of that year, the family moved to the village of Vétheuil where they shared a house with the family of Ernest Hoschedé, a wealthy department store owner and patron of the arts. In 1878, Camille Monet was diagnosed with uterine cancer, and she died on 5 September 1879 at the age of thirty-two. I one day found myself looking at my beloved wife's dead face and just systematically noting the colours according to an automatic reflex! 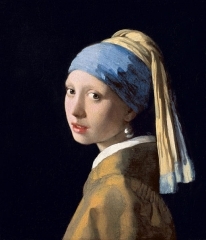 John Berger describes the work as "a blizzard of white, grey, purplish paint ... a terrible blizzard of loss which will forever efface her features. In fact there can be very few death-bed paintings which have been so intensely felt or subjectively expressive." After several difficult months following the death of Camille, Monet began to create some of his best paintings of the 19th century. During the early 1880s, Monet painted several groups of landscapes and seascapes in what he considered to be campaigns to document the French countryside. These began to evolve into series of pictures in which he documented the same scene many times in order to capture the changing of light and the passing of the seasons. Monet's friend Ernest Hoschedé became bankrupt, and left in 1878 for Belgium. After the death of Camille Monet in September 1879, and while Monet continued to live in the house in Vétheuil, Alice Hoschedé helped Monet to raise his two sons, Jean and Michel. She took them to Paris to live alongside her own six children, Blanche (who married Jean Monet), Germaine, Suzanne, Marthe, Jean-Pierre, and Jacques. In the spring of 1880, Alice Hoschedé and all the children left Paris and rejoined Monet at Vétheuil. In 1881, all of them moved to Poissy, which Monet hated. In April 1883, looking out the window of the little train between Vernon and Gasny, he discovered Giverny in Normandy. Monet, Alice Hoschedé and the children moved to Vernon, then to the house in Giverny, where he planted a large garden and where he painted for much of the rest of his life. Following the death of her estranged husband, Monet married Alice Hoschedé in 1892. 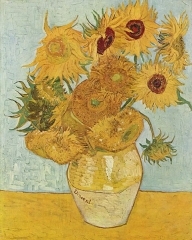 Vase with Twelve Sunflowers-Painter: Vincent .. Girl with a Pearl Earring-Painter: Johannes V..
Two Sisters ( 1881 ) -Painter: Pierre-August..
Woman With White Socks, 1825-30..
Woman with a Parrot, 1827.. 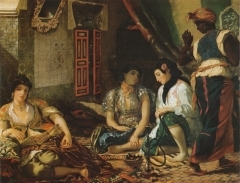 The Women of Algiers, 1834..